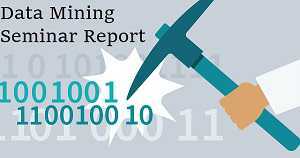 Download the PDF reports for the seminar and project on Data Mining. The seminar report discusses various concepts of Data Mining, why it is needed, Data mining functionality and classification of the system. Also, download Data Mining PPT which provide an overview of data mining, recent developments, and issues. Data mining is a powerful new technology with great potential to help companies focus on the most important information in their data warehouses. It has been defined as the automated analysis of large or complex data sets in order to discover significant patterns or trends that would otherwise go unrecognized. Why we need Data Mining? Data explosion problem: Automated data collection tools and mature database technology lead to tremendous amounts of data stored in databases, data warehouses, and other information repositories. We are drowning in data, but starving for knowledge! Solution: Data warehousing and data mining. Data warehousing and on-line analytical processing. Extraction of interesting knowledge (rules, regularities, patterns, constraints) from data in large databases. We have been collecting a myriad of data, from simple numerical measurements and text documents to more complex information such as spatial data, multimedia channels, and hypertext documents. Here is a non-exclusive list of a variety of information collected in digital form in databases and in flat files. Data mining tools and applications are helpful in business management, business intelligence, selective marketing, and decision analysis. Download the seminar report and PPT to learn more. Download Data Mining Seminar Report and Data Mining PPT.